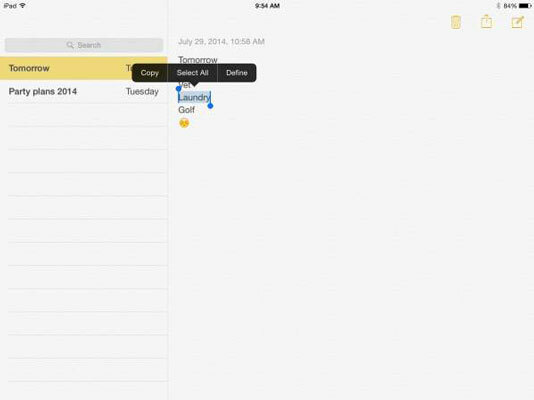 The Notes app that comes bundled with your iPad includes two essential editing tools that you’re probably familiar with from using word processors: Copy and Paste. 1With a note displayed, press and hold your finger on a word. Press and hold the spot in the document where you want to place the copied text. 3On the popover that appears, tap the Paste button. 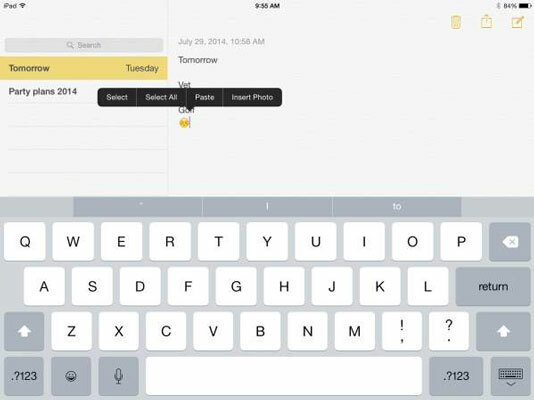 4If you want to select all text in a note to either delete or copy it, tap the Select All button on the toolbar. All text is selected and select commands from the toolbar that appears to cut, copy, or paste text. To extend a selection to adjacent words, press one of the little handles that extend from the selection and drag to the left or right or up or down. 5To delete text, you can also choose text by using the Select or Select All command. Then tap the Delete key on the onscreen keyboard.